-Good kill for the Pens. A good start tonight is unspeakably important. -Goligoski back with Engelland now. Good shift by the Staal line. -Michalek crept in close to the net and almost buried a Kunitz rebound but Price slid over to deny him of his first goal. -Malkin has created 2 great scoring opportunities so far. Best he's looked in the last few games. -Habs now picking up the pace. Fleury had a bit of difficulty with one shot but leaned back to keep it out of the net. -Interesting series of events. Malkin with a great neutral zone steal, drops it to Kunitz, Kunitz turns it over and Montreal starts a 2 on 1, Plekanec ends up all alone on Fleury but shot it at the side of the net. -Good catch from Errey and FSN cameras. Subban took a kick at Staal behind the net that looked VERY similar to the one that sidelined Jordan for 5 months but this time Jordan was able to fall less awkwardly and got up fine. No penalty. -Letang to the box. Great penalty kill again by the Pens. -Goligoski takes a drop pass from Kunitz and fires a HOWITZER to the corner of the net! He shot it so hard I'm not sure Price ever even saw it. 1-0 Pens. -Malkin with a blast but right into Price. Less than 5 to go in the 1st. -Letang and Goligoski again? Both are playing well tonight so I guess Dan can get away with it. -Period ends at 1-1. Pens looked a bit better at the end of the frame. 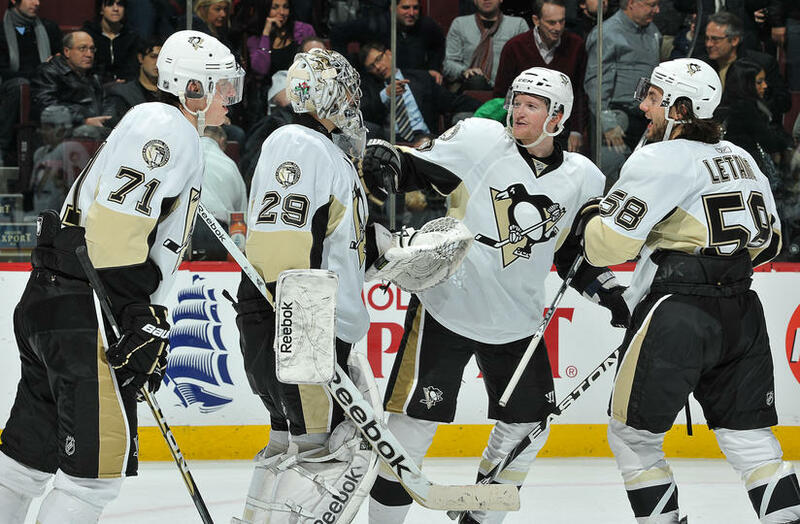 Notes: Besides that momentum-killing defensive hiccup this period belonged to Pittsburgh. Malkin looked as good as he's been in a the last week and the defense was for the most part effective in taking the heat off Fleury. This game just has the feel that it won't take much to blow it apart for either team. Like to see the Pens pick up the checking game. -Slow start to the period. 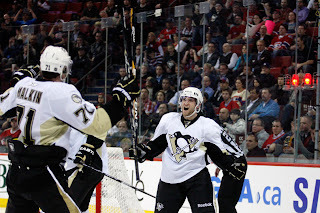 -Malkin behind the net feeds a pass in front to Kunitz. Price makes the save but Kunitz is high-sticked in the process. Powerplay Pens. -Kennedy with a decent backhand opportunity on the next shift. Price stops the shot and the puck trickles into the corner. Referee thought it was in Price's pads so he blows the play dead and ends any rebound opportunity for the Pens. -Habs must have felt some pressure so Martin calls a timeout a few min into the 2nd period. They don't have any more left for the rest of the game. -Conner-Talbot-Rupp line log 3 quality shots at the end of a shift. Still tied midway through the 2nd. -Wisniewski off for slashing. Pens get 2nd powerplay of the game. -Another back and forth series: Habs on a shorthanded 2 on 1, great diving block by Goligoski, Letang scoops up the puck and headmans TK on a 2 on 1 with Geno. Kennedy gets the pass through to Malkin but Price makes the save. -Letestu with a great chance, then Gomez with one the other way, and then Dupuis with a great shot back on the other side, and then Gomez again. Wow! Both goalies getting a workout. -Fleury is giving up rebounds but he is also stopping them. Finally we get a commercial break to catch our breath (the teams AND the fans). -Habs whistled for having about 27 guys out on the ice. Pens powerplay. -Staal gets his feet set, takes a nice backhand feed from Letang, and slips it through Price's pads. First point and now his first goal of the season! 3-2 Pens with a huge timely goal at the very end of the period. -The final 10 seconds runs off after Staal's goal. Period ends 3-2 Pens. Notes: This period was enough to make you dizzy! In the beginning they traded goals and then it was just chance after chance on both sides of the ice. 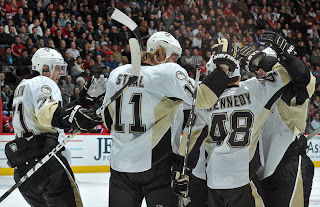 That Staal goal couldn't have been timed better and the Pens really did take the last laugh into the locker room. The Pens might be better off trying to slow down the 3rd period and chip away at hopefully an insurance goal. As we learned on Monday it's certainly not over but you gotta love the way the Pens have played so far. -Michalek hits the boards hard after getting tangled up with Pouliot. Pouliot sent to the box although it really didn't look like he intended to trip up Michalek. -Staal anchored in front of the net on the powerplay. Letang takes a shot, Price gives up the rebound, Staal pokes it loose and Goligoski buries it into an essentially empty net! 4-2 Pens with their 3rd powerplay goal of the night against Montreal's top rated PK unit. -Pouliot slashed Kennedy. Whistle blows but he shoots it anyway. He actually scored but it was obviously waved off in favor of another Pens powerplay. -Letestu and Subban get into a wrestling match behind the goal. And Letestu topples the much larger Subban to the ground! -Pens completely controlling things as the period hits the halfway mark. -Letang fires a slapshot on net right past Price! 5-2 Pens and the FOURTH powerplay goal of the night. Kunitz may have gotten a piece of it but as of now it's Letang's goal. -Gionta and Gomez causing problems in front of Fleury. Little bit of mayhem afterwards. -Commercial break with just under 4 minutes to go. Let's hope this is a different story from Monday (and it will be). -Pens defense is locking it down. -Goligoski had a chance for the hats but Price was able to make the save. -Goligoski to the box. No hat trick for him tonight. Soft call. -Pens with a stellar PK. They will certainly be 1st after their PP put 4 up on Habs. Notes: Fantastic. If the Pens play more games like this then I think this team can really be special this year. Everything/everyone that has been heavily criticized this year (Goligoski, Kennedy, powerplay) was phenomenal. After not being to say anything positive about them on Monday I simply cannot say enough today. -Goligoski is getting back to "early season form." And even more impressive was that he was making defensive plays tonight. -Malkin still hasn't really stepped up to the level people thought he would without Sid but he did play a solid, consistent game tonight. -Tyler Kennedy played one of his best of the year. He was actually taking over shifts in the 2nd period. -Staal has been playing this well since he came back but it's great to see him finally rewarded for it. -Last year's dynamic 3rd line reunited for the 2nd game and they looked good. 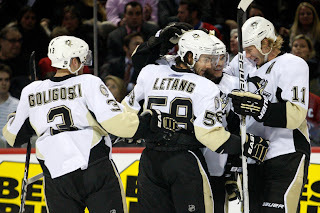 Does Bylsma keep them together or reunite the buzz line when Sid comes back? -Pens did a good job keeping Subban from drawing them into dumb decisions. PK was a non-factor tonight. -Watching Rupp and Conner together on the ice is quite entertaining. Totally different styles but they actually work well together. This was actually one of my favorite games of the year considering when it happened and the conditions around it. These boys were out to prove a point that they can win without Sid and save me the trouble of drafting a post tomorrow explaining why I think they don't need to trade the entire team for scoring wingers. And Fleury's celebration at the end: epic... Proud to be a Pens fans tonight. -The importance of Staal's goal in the last 10 seconds of the 2nd period can not be forgotten. Not only was it a momentum shifting goal, but it was so late in the period that Montreal had no chance to respond. "With or without Sid, we're not going to change our game. We're going to try and grind teams down and play our best hockey."